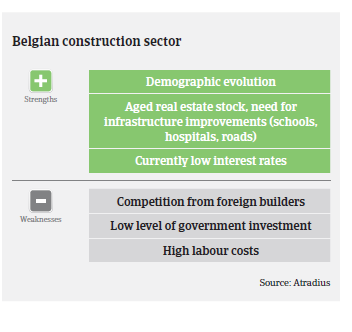 The Belgian construction sector is very fragmented, mainly consisting of small and medium-sized businesses. Subcontracting is very common, but subcontractors are generally more vulnerable than larger businesses, which tend to pass on the price pressure to the next level. Larger companies also benefit from higher margins in private-public co-operation projects and are increasingly looking for business opportunities abroad. In 2016 the Belgian construction sector continued its slow rebound after bottoming out in 2013. The recovery is supported by increasing work volumes (larger order portfolios with a longer time horizon), triggered by low interest rates, tighter environmental regulations and insufficient infrastructure investments in the past. Due to the upcoming municipal elections in 2018, an increase in infrastructure works and/or works for utility companies is expected. However, due to budget constraints, this surge in public works will be less pronounced than in the past. 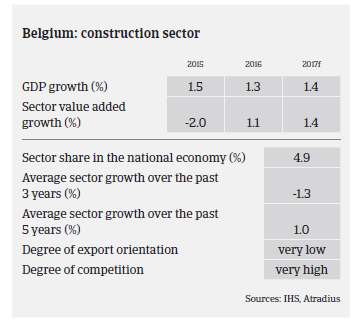 A full-scale rebound of the Belgian construction sector is hampered by the still difficult economic climate, with rather low annual GDP growth rates of around 1.5%, government budget constraints (with a very price-sensitive public tendering) and the fact that banks remain restrictive in providing loans to construction businesses. Additionally, Belgian construction businesses still suffer from high labour costs, especially when compared to construction businesses from Eastern Europe active in Belgium. As a result, margins and profits of many businesses remain under pressure. 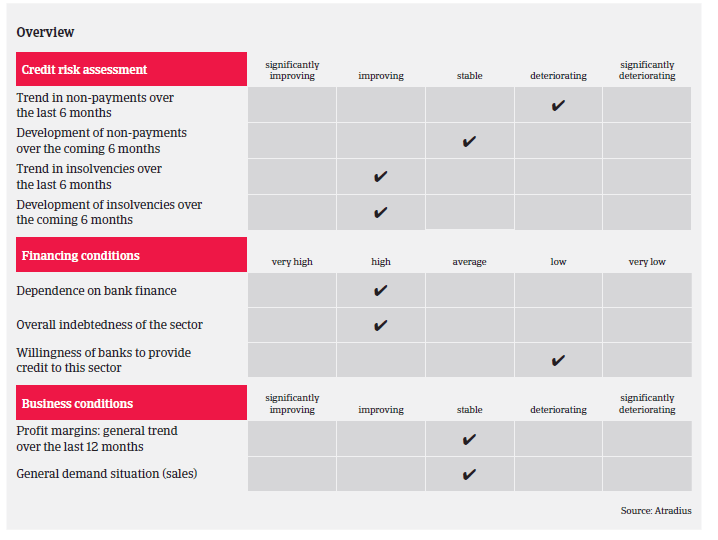 Construction companies´ working capital needs are very high, as advanced payments are not common in Belgium, while the administration (approval of works) and payments by the Belgian government are very slow. In general, payment terms tend to be long in the sector, i.e. “60 days end of month” is very common. Quite often construction businesses are forced to accept unfavourable payment terms. Larger businesses tend to impose longer payment terms on their subcontractors as a cheap source of financing. As construction companies are regularly confronted with project delays, this has an adverse impact on profitability, not only because turnover is lower than expected, but also due to volatile raw material prices and unfavourable price index revision clauses. Given all those constraints, it comes as no surprise that we observed an increase in payment delays in 2016. Due to the difficult market conditions, the number and amount of notifications of non-payment is expected to remain high. That said, we expect business failures to decrease further in 2017. However, the overall level of construction insolvencies remains high, given the steady increases seen in the years 2008-2013. Our prudent underwriting stance should allow us to maintain our current level of engagement. In order to sustain our risk appetite, it is necessary to identify the most affected companies/subsectors and to contact buyers for up-to-date financial information and performance outlooks. We are more restrictive in underwriting vulnerable segments such as erection of roof covering and frames, joinery installation, floor and wall covering, demolition and wrecking of buildings, earth moving, plumbing and civil engineering works.